I like books that employ flashbacks, but the many methods authors use to enrich their stories with scenes from the past can often fall short of intended goals. 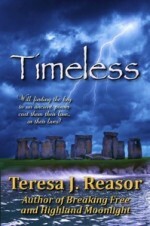 Teresa Reasor has a knack for blending the present with the past in a way that strengthens and fleshes out the story while also creating more compelling, sympathetic characters through this technique. The story of Regan and Quinn is intertwined with Coira and Braden’s magical tale. The story’s mythology was irresistible for me as a reader. I wanted to know more about the characters’ lives, the secret of the stones, and how these elements would intertwine. I was especially impressed with the high level of Reasor’s detail (and research) and the time she took to ‘immerse’ the reader in Regan’s world; namely, the underwater archaeological find she intently explored. I felt as though I was there with her amidst the murky water, worrying about her tank, feeling the sensation of bubbles around her, and seeing the cloudy silt that rose up and obscured her vision. I found myself really drawn into the environment as well as the intrigue, trying to solve the mysteries before they were revealed to me. Timeless is fast-paced and tense when it needs to be and at other times slows down to capture the inner struggles of its characters. Reasor covers several characters’ motivations very well–something else that I really like in a story. Character development is believable and enjoyable. I had no problem suspending my disbelief within the magical world Reasor created. A worthwhile read! Five hearts. I’m so thrilled you enjoyed the book!!! Thank you so much for the wonderful review!!! I’m glad! I really appreciated the time you took to flesh out the whole archaeological experience. There were many edge-of-your-seat moments in that environment. Loved it!